Its now the year 2000 and the Rare/Nintendo partnership is coming to an end. But before all of that, the first game on the list is one of Rare’s best ever games, delayed several times…but ultimately well wroth the wait. Perfect Dark: This spiritual successor to Goldeneye made it to shops (eventually) in 2000. 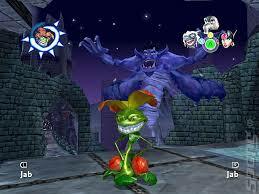 Developed by Rare for the N64 and often cited as one of the very best games ever made for the N64 console. With you playing as Carrington Institute agent; Joanna Dark. Set in the year 2023 against the backdrop of an interstellar war between two races: the Maians, who resemble the archetypal grey alien, and the reptile-like Skedar extraterrestrials who use a holographic disguise to appear as humans. Meanwhile, on Earth, there is an ongoing rivalry between two factions: The Carrington Institute, a research and development centre founded by Daniel Carrington that secretly operates an espionage group in league with the Maians. While dataDyne, a defence contractor corporation headed by Cassandra De Vries that secretly maintains a deal with the Skedar. Joanna Dark is given the codename “Perfect Dark” due to above excellent scores in training, has been sent to rescue a scientist named Dr. Caroll from the dataDyne headquarters, where she uncovers an alien conspiracy. Perfect Dark is a FPS styled game using the same basics implemented by Rare with their 007: Goldeneye from 1997, Perfect Dark adds a lot more depth and variety throughout the game. 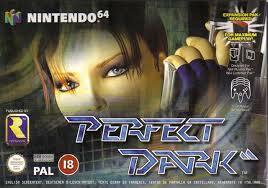 With a single-player campaign, a co-op mode and plenty of multi-player modes too, Perfect Dark packed in a lot of game. Perfect Dark was an amazing game from Rare, but I think it’s about time we caught up with another one of their previous IPs in this Rare Replay collection. Banjo-Tooie: Developed by Rare for the N64 and relased in 2000. Banjo-Tooie sees the return of Banjo & Kazooie as well as antagonist Gruntilda. Taking place two years after the events of the previous game, Banjo-Kazooie. After the defeat of Gruntilda by Banjo & Kazooie, the two are playing poker with their friends Mumbo Jumbo and Bottles in Banjo’s house. Elsewhere, Gruntilda’s two sisters; Mingella & Blobbelda arrive in a digging machine, the Hag 1 and they free Gruntilda with a magical spell. Gruntilda’s time spent underground from the end events of the last game have rotted her flesh away and reduced her to a skeleton. So seeking revenge, Gruntilda destroys Banjo’s house before fleeing with her sisters. Banjo, Kazooie, and Mumbo exit the house before it is destroyed. However, Bottles stays behind believing it is all just to be a joke and he gets caught in the blast and is killed. The three remaining friends decide to put an end to Gruntilda’s plans, and swear to track her down. The basics of what made the last game so good are back, but this game brings a few new ideas and tweaks to the original. With all new playable characters, a more open and explorable world as well as a multi-player mode. Banjo-Tooie (as with it’s predecessor) met with critical acclaim. 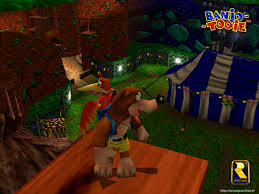 Game Revolution considered Banjo-Tooie to be a worthy successor to Banjo-Kazooie and highlighted the scale of its worlds. 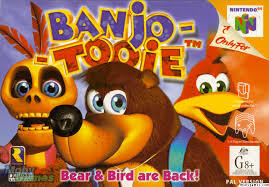 GamesRadar described Banjo-Tooie as a game that requires a massive time-investment on the player’s part, saying that “Keeping track of what you can do next, or where you can re-visit to get something new, requires either a photographic memory or copious note-taking”. GameSpot, praised the game’s level design and progression, stating that the constant collecting of Jiggies “keeps the controller glued to your hand and your eyes in a fixed gaze”. Up next is the last of the Rare/Nintendo games in this collection before Microsoft brought out Rare…but what an hilariously crude game it is. 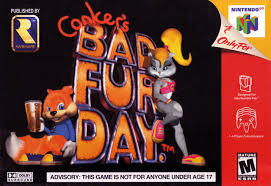 Conker’s Bad Fur Day: A game infamous for it’s jokes, references and humour, Released in 2001 for the N64 by rare…this one of for adults only. With you playing as the titular Conker the squirrel. After promising to be home soon to his girlfriend, Berri. Conker instead gets lost in a strange world and finds a local bar, where he stays for several hours and enjoys many, many, many alcoholic beverages instead. The still drunk and hungover Conker decides its time to head home…except he has no idea where he is or where home is. Conker must traverse this strange land he finds himself in just to get one simple task completed, to go home. Along the way, you’ll met a wide array of weird and wonderful characters as you drunkingly stumble home. 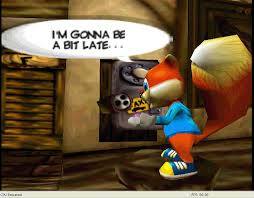 Conker’s Bad Fur Day became infamous for it’s adult humour, often disgustingly rude & crude…but always funny. Loaded with in-jokes, film/TV references and some of the most adult content you’ll ever see in a Nintendo game. The game was/is a classic action 3D platformer similar to Rare’s previous Banjo-Kazooie, only not as “kid friendly”. Conker’s Bad Fur Day was awarded the 2001 BAFTA Interactive Entertainment Award for sound, IGN’s Game of the Month for March 2001, and GameSpot’s Best Platform Game for 2001. Well, that is it for the Nintendo years on this collection. We now get into the Microsoft and Xbox years and a time where mist fan think Rare started to fade. 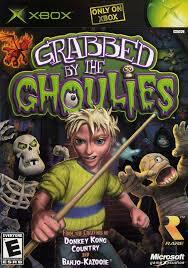 Grabbed by the Ghoulies: Funny title, but is it a good game? Released for the Xbox in 2003 and developed by Rare. Originally planned as a Gamecube game before Microsoft brought Rare out. This game was the first Rare game relased for the Xbox console. You play as a young boy named; Cooper. While lost during a storm and trying to find their way via a map, Copper and his girlfriend Amber find a dark and dreary house, Ghoulhaven House, which can not be found on their map. As they approach the house, Baron von Ghoul looks down from his window and orders his two gargoyles to retrieve the two humans. They only manage to grab Amber and take her into the house. Cooper has no choice but to attempt a rescue mission. However there is much more to Ghoulhaven House than meets the eye. With assistance form Crivens, the mansion’s butler. Cooper explores the house in an attempt to save Amber from Baron von Ghoul and his minions. 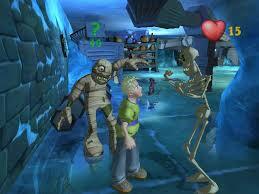 Grabbed by the Ghoulies is an action, 3D adventure game with a little platforming thrown in too. Each room of the house has it’s own challenge to complete before you can move on. Challenges include eliminating all Ghoulies in a room, beating only a specified kind of Ghoulie while avoiding eliminating the rest or defeating a boss. The controls use a twin stick method, with one stick moving the Cooper while the other sick attacks in the direction pushed. Hidden around the house are Rare books (as in the developer Rare not they are “rare books”) and if Cooper collects five Rare books, a Bonus Challenge will be unlocked. The main objective of the bonus challenges is to revisit one of the rooms and perform a different task within it, such as defeating a number of enemies in a certain amount or time or surviving a duel with the Grim Reaper. Each challenge completed give you a bronze, silver or gold medal depending on how well you did. You can also earn a platinum medal if you complete a challenge on a higher difficulty. With every platinum medal obtained, a piece of the game’s concept art is unlocked. If you can earn all 20 platinum medals, an option is given to reset the game with Amber unlocked as a playable character. The game was met with mixed reviews from critics upon release. Eurogamer stated that the game “never blew them away” but always kept a high standard of creativity. However,they praise the animation and overall character designs of the game. 1UP stated that the game’s “biggest problem” was its unchallenging game-play, stating that it was “repetitive” and often compared it to game-play of that from the 16-bit era. GameRevolution admitted that the game-play appeared “interesting” at first, but grew tiresome the longer the game is played, despite its short length. Arts & Sciences in 2004. With the about average Grabbed by the Ghoulies, Rare hardly showed the high standards they had previously with Nintendo. Maybe their first Xbox 360 game would change all of that? 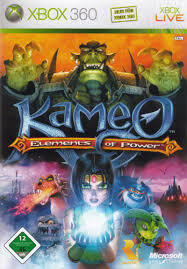 Kameo: Elements of Power: Was a launch title for the Xbox 360 from Rare relased in 2005. Was set to be the start of an new franchise, but the sequel was cancelled. You play as Kameo, an elf princess with the ability to transform into 10 elemental warriors and use their unique abilities. The Elf Queen passes down a mystical Wotnot Book and the ability to become all of the Elemental Warriors to her youngest daughter Kameo, but this causes Kalus, the elder daughter, to grow jealous. So in an act of revenge and jealousy, Kalus releases an ancient curse which previously held Torn the evil Troll King captive in stone. This allows Thorn to unleash his troll army upon the world. Working alongside Thorn and his army, Kalus kidnaps her mother, her two uncles and her aunt, then proceeds to torture them. Kameo dashes to their rescue, only to be knocked unconscious by Thorn and left on The Mystic’s doorstep. The Mystic informs Kameo that the Elemental Warriors are now Elemental Sprites who have been captured by the Shadow Trolls. She now has to rescue and absorb the Elemental Sprites, save her family and defeat Kalus and Thorn. Kameo: Elements of Power is an open world action/adventure game akin to the Zelda series. Giving the player the freedom to explore the world however they wish, but some areas being locked until you progress in the story. Well that is for this part. As we approach the final 5 games in this 30 game collection, we see the return of not one, not two, but three Rare classics as well an all new IP. See you in part VI. This entry was posted in LBoG: Retrospectives and tagged Banjo-Tooie, Conker's Bad Fur Day, Grabbed by the Ghoulies, Kameo: Elements of Power, LBoG: Retrospectives, Little bits of gaming, Perfect Dark, Rare, Rare Reply on 06/08/2015 by Steve Perrin.